Original name - Snydale Victoria Colliery. 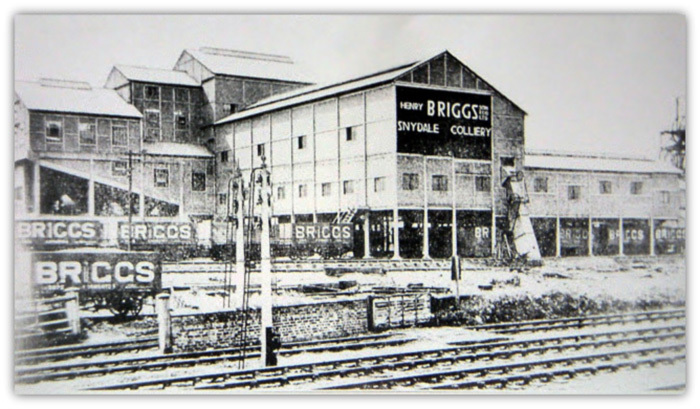 Owners - Rhodes and Dalby - Henry Briggs and Sons Ltd - National Coal Board. Shaft sinking began - 1863. Maximum output - 185,000 tons in 1953 and 1954. Maximum employment - underground - 702 in 1922. Surface - 209 in 1922. Note: This list will be extended as more information becomes available. Not all ages or first names are known. Benjamin Hepworth age 35 and John Greenwood age 34, shaft sinkers, were killed by an explosion of firedamp during shaft sinking operations. Henry Peel Noble age 29 and John Barratt age 35, drifters, were suffocated by powder fumes after firing a shot. Ambrose Webster, a blacksmith, took an ordinary flame lamp down the pit instead of a safety lamp and ignited firedamp. He died a few days later from his burns. R Poole and W Luter, colliers, took their candles into the goaf (a waste area) and ignited gas. Abraham Roberts, a pony driver age 25, was crushed by tubs. George Smith, a collier age 28 was killed by a fall of roof. Jim Corrigan, a collier age 49 was killed by a fall of roof. Samuel Hardcastle, a furnaceman age 55 attempted to get off the cage when it set off and crushed him. William Wilcox , a pony driver age 16 was killed by a fall of roof. Samuel Camp age 20 a pony driver. W Wilcox, a collier age 50 was killed by a fall of roof. Michael James Luckman, a pony driver age 14 was run over by tubs. William Massey, a collier age 56 was killed by a fall of roof. E Luckman, a pony driver age 14 was crushed by tubs. Samuel Raleigh, a collier age 19 was killed by a fall of roof. John Gleed, an underground labourer age 25 was found lying across the tub rails and on arrival at Clayton Hospital it was found his back was broken and he died five days later. J Nash, a collier age 25 was killed by a fall of coal. J Stead, a collier age 26 was injured by a fall of roof and died three days later. George Oliver a collier age 49 strained himself lifting a tub and died five days later. M Layne, a collier age 30 was killed by a fall of roof. Charles Foster, a collier age 44 was killed by a fall of roof. Isaac Harvey, a surface labourer age 62 was pushing a wagon under the screens when another wagon crushed him. J Machin, a pony driver age 17 was trapped between tubs on January 26 and died April 21. Ernest Staples, a surface worker age 20 was found dead in a coal washer hopper. It was presumed he fell from a ladder. R Hammond, a pony driver age 17 was found dead under a tub. T Atkinson, a haulage lad age 17 was killed when the haulage rope jerked and knocked him in front of the tubs. W Jackson, a trapper (in charge of a ventilation door) age 14 was passing some full tubs when the horse moved forward and he was crushed between a tub and a door frame. He died two days later. Isaac Hufton, a collier age 58 of Andrew Street was injured by a fall of roof and died the same day. Joseph Wardle, a stone miner age 28 was enlarging a roadway and was killed by a fall of roof. James Green, a collier age 28 was killed by a fall of roof. Benjamin Ward, a collier age 49 was injured by a fall of roof. He was taken home where he died shortly afterwards. Joseph Oliver, a collier age 40 was killed by a fall of roof. Henry Lockwood, a carter age 20 was caught between a coal cart and a wagon and he died five days later. Thomas Lucas, a collier age 56 was killed by a fall of roof. Cyril Jones a byworker age 22 of Sharlston was injured by a fall of roof on March 1 and died of pneumonia on March 10. 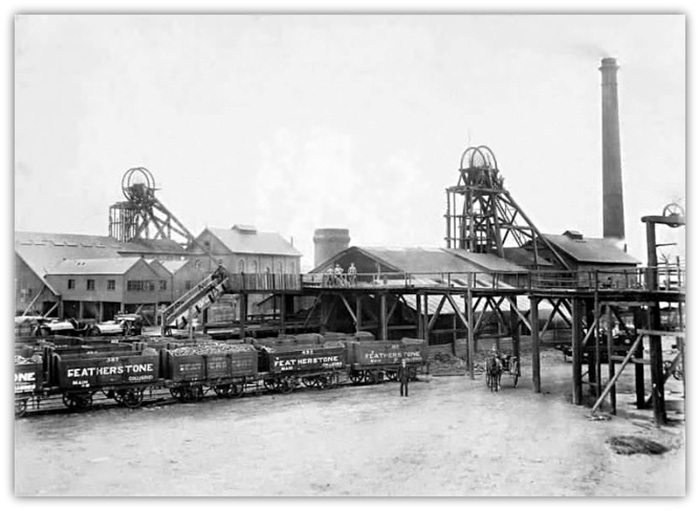 Original name - Featherstone Colliery. Owners - John Shaw - Featherstone Coal Company - South Kirkby, Featherstone and Hemsworth Collieries Limited. Shaft sinking began - 1868. Maximum employment - underground - 2,095 in 1924. Surface - 480 in 1924. William Phoenix, W Livesey and John Cawthorne. Phoenix, a deputy, was examining the pit before work started and took off the top of his lamp and ignited firedamp. Livesey was 14 and Cawthorne was 13. C Green, a collier age 25 was killed by a fall of roof. Jas McVay, a surface screener, was crushed by wagons. John Henry Dixon, a collier age 27 was killed by a fall of coal. E Walker, a collier age 20 was killed by a fall of stone. John Hunter, age 14 was run over by tubs. William Wait, a collier age 62 was crushed by tubs. C Lunn, a pony driver age 16 was run over by tubs. W Whaites, a collier age 24 was injured by a fall of roof on February 15 and died March 11. T Parkin, a collier age 40 was killed by a fall of coal. E Limb, a collier age 56 was killed by a fall of roof. D Hodgson, a screener age 17 was crushed by wagons and died the next day. Adolphus Rowley, a pony driver age 19 was crushed by tubs and died two months later. Thomas Cardo, a trapper age 14 fell out of the cage. H Glossop, a shunter age 22 was crushed by tubs. W Longbottom, a surface worker age 26 was hit on the head by a lump of coal on December 1 and died on December 20. J Westwood, a collier age 49 was killed by a fall of coal. Tom Roberts, a pony driver age 14 was injured when his head was crushed between a tub and the side of the roadway. He was taken home and died the same night. Joseph Taylor, a byworker age 23 was killed by a fall of stone. J Foster, a collier age 30 was killed by a fall of roof. John Henry Thomas, a labourer age 14 was knocked down by a wagon and died a few hours later in Clayton Hospital. William Scott, a collier age 54 was injured by a fall of coal and the next day in Clayton Hospital. T Dutton, a driver age 16 was crushed between a tub and a bar. George Horbury, a shunter age 22 of Streethouse was riding on his shunter's pole when he fell off and was run over by a wagon. E Frobisher, a colliery age 50 was killed by a fall of roof. F Addey, a collier age 24 was killed by a fall of roof. Henry Womersley, a byeworker age 55 of Kinsley was killed by a fall of roof. J Barnes, a collier age 25 was killed by a fall of coal. John Hardy, a collier age 40 of Pretoria Street was injured by a fall of roof last December 5 and died on April 20. James Bennett, a deputy age 46 was hit by runaway tubs and taken to Clayton Hospital where he died soon after. George Eccles, a collier of Pontefract age 53 died in Clayton Hospital after being buried by a fall of roof. John Henry Barnett, a miner of Pontefract age 30 was killed by fall of roof. Alfred Flockton, a collier age 36 of Castleford was killed by a fall of coal. John Beach, a hanger-on age 34 of Granville Street was killed when he was standing on the sump boards and was hit by the cage. John Turner, a haulage lad age 18 slipped and fell on the rails and was run over by tubs. He died four days later in Pontefract Infirmary. Alfred Rigg, a byeworker age 24 of Gladstone Terrace was injured by a large stone which fell from the roof and he died the next day in Clayton Hospital. John Hill, a collier age 33 of Pretoria Street was killed by a fall of roof. Charles Wheatley Patrick, a collier age 57 was killed when he was crushed by runaway tubs. Bernard Maurice Westbrook, a pony driver age 16 of Cowards Buildings was found dead after being run over by a full tub. Benjamin Parker, a collier age 49 of Purston was killed by a fall of roof. Samuel Morton, a collier age 50 was injured when a pot hole (a fossilised tree trunk) fell on him on July 29. He died on August 7. James Hamer, a filler (trainee collier) age 21 of Albert Street was hit by a fall of roof on December 9 which fractured his spine. He was taken to Clayton Hospital where he died on December 18. James Turton Haggas, a miner of Crossley Street was killed by a fall of stone. J W Machin, a pony driver age 17 died when he was crushed between two runs of tubs. Thomas Lyman, a deputy age 54 was killed by a fall of roof. John William Alder, a collier age 31 was killed by a fall of roof. Enoch Llewellyn, a pony driver age 14 fell and a sharp stone cut his throat. Joseph Slater, a byworker age 57 was hit by runaway tubs. John Barnett, a collier age 59 of Lord Street was killed by a fall of coal. William Wilks, a collier age 44 of Thorntons Buidings was killed by a fall of roof.